Acumatica Cloud ERP delivers a suite of fully integrated business management applications such as Financials, Distribution, CRM and Project Accounting, powered by a robust and flexible platform. With the Power BI Acumatica content pack, you can quickly connect and immediately gain insights into your opportunity data. This content includes an out-of-box dashboard, a set of reports and a curated dataset to explore and provide details such as your total won opportunities by date. 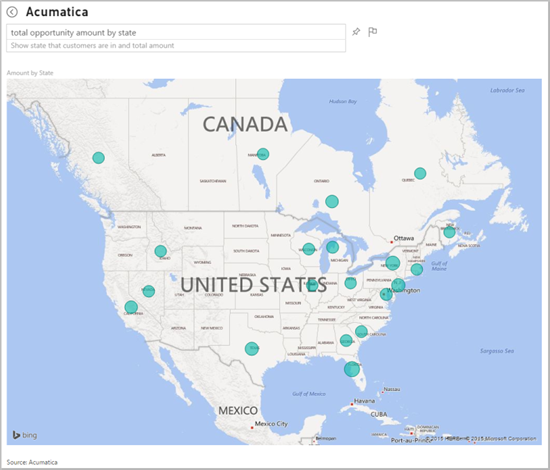 This post will detail how the Power BI content pack helps you explore your Acumatica data. 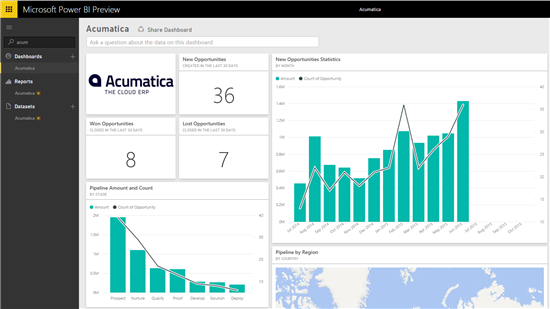 For additional details on how to get started, please see the Acumatica content pack for Power BI help page. Note that this content pack has a minimum requirement of Acumatica Cloud ERP v5.2. The content pack brings in data about your opportunities, customers, employees and supervisors from Acumatica. To get started, just log in using your Acumatica credential and connect to the OData feed provided in your Acumatica account. (For more info on the OData feed, contact your administrator. The feed URL usually looks like this: https://<sitename>/odata). A dashboard is automatically created once you’ve provided credentials. You’ll see the new dashboard, report and dataset all indicated with an asterisk next to the name. The dashboard a set of tiles, with each one displaying a specific metric to monitor from the dashboard view. Select one of the tiles to drill in further to the reports, such as “New Opportunities Statistic”. This brings you to the New Opportunity report, one of four pages of reports that are included as part of the out-of-box content. Other reports include Won Opportunities, Lost Opportunities and Opportunity Pipeline. Each tile on the dashboard may lead to different report pages. The reports include a set of visuals with different insights. You can hover over any of the items for more details, or select a particular value to cross filter the other visuals on the page. For example, selecting “Service” in the top left visual, filters the other visuals to show the impact of that value. Any of the existing visuals can be pinned to the dashboard, allowing you to fully customize it for your needs. The filter pane allows you to change the slice of data you’re viewing. You can also switch into Edit mode, to view all the fields available for your reporting. 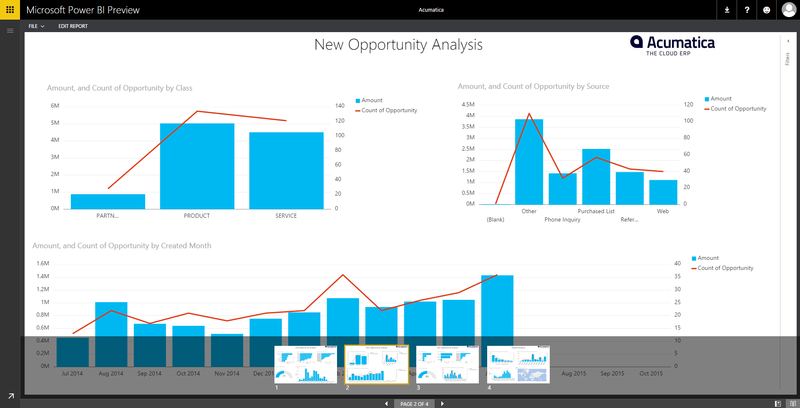 This allows you to edit or add additional visuals to customize your report and dashboard. Another way to explore the data is through the question box above the dashboard. Start by asking a question of your data – such as “total opportunity amount by state” or “total number of opportunities”. Those results can also be pinned to your dashboard by hovering over the image and selecting the pin icon. After the initial import, the dashboard and the reports continue to update daily. You can control the refresh schedule on the dataset. 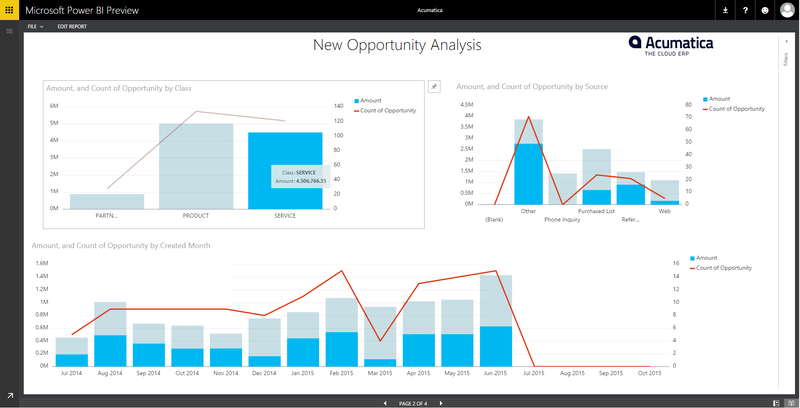 With the Acumatica content pack for Power BI, you have an initial set of metrics and insights allowing you to explore your data even further.